Metro Records releases this new double compilation of Procol material from 1967 -1970: there's nothing here that confirmed Procoholics won't know, but you get 2.5 hours' music at a very nice low price: like their last offering, this would be an excellent good present to get for someone who doesn't know the band well: order it from Amazon UK here or from Amazon.com here. This album comes with an 8-page booklet, containing a variety of small photos. The published credits are interesting in that they attribute the mono AWSoP to Gary Brooker (Vocals/Piano) Matthew Fisher (Hammond Organ) Ray Royer (Lead Guitar) David Knights (Bass Guitar) Bill Eyden (Drums), but the stereo mix of the same song is credited to all the above, including Eyden, 'with additional drums from Bobby Harrison'. There are other odd errors, some due to the variant track-listings of UK/US versions of the first album. The Good Captain Clack track is the album version, but it is listed as if it were the 45 rpm B-side. Likewise In the Wee Small Hours of Sixpence is listed as if it were the original 45 rpm B-side, whereas in fact it's the well-known alternative take that probably features Bobby Harrison (see here). Perhaps the most curious 'blip' is the attribution of the original version of Magdalene (My Regal Zonophone): 'featured on the albums Procol Harum / A Whiter Shade of Pale'. In any event there should be an explanation of the poor quality source used here – the acetate: tracks here have of course been taken from Westside's ... Plus! series, where this matter is dutifully elucidated. Luckily the album does include: 'for more information on Procol Harum you may wish to check www.procolharum.com'. A very unusual group creation, Procol Harum were assembled under purely accidental circumstances to make the most of a record honed in a studio environment [sic!]. Inspired by gothic cathedrals and grand classical themes their musical début with the ethereal sounding A Whiter Shade of Pale made them one of the biggest hits of 1967. With an eventual style built around an eclectic mix of blues-based riffs and progressive classic rock the band soon evolved from a session studio ensemble into a successful long-term act both at home and in the US from where they even received letters from devoted fans wanting to do University theses on their lyrics. Following their début in 1967, Procol Harum quickly proved they were no one-hit wonders. By the early 1970s with the majority of the group's single releases outselling all their immediate rivals Procol Harum had become something of a cult 'Pop' phenomena [sic] in progressive rock circles. With instant chart hits like A Whiter Shade Of Pale and Homburg under their belts the band thus had the ability to reach out to more middle-brow listeners with their records. Listeners who may not have had the patience to trawl through the lengthy instrumental indulgences of the likes of Yes, ELP, Genesis or King Crimson. Furthermore this generation of early Seventies bands had themselves drawn instinctively upon the musical style that the band had established. Within a couple of months of their début Procol Harum had established a solid group line-up with individual stars in the making. Main man Gary Brooker's distinctive soul-influenced singing style instantly gave the band a strong audible identity while on the songwriting front; Procol Harum's musical style evolved in a decidedly formulistic [sic] fashion with singer/pianist Brooker and lyric writer Keith Reid providing almost the group's entire recorded repertory. Essentially simple, it was a way of working a sound the public easily warmed to. In the live arena other band members came into the spotlight. Out front Robin Trower's flashy blues-based guitar made him the visual star of the band set against drummer BJ Wilson's unique percussive style and keyboardist Matthew Fisher's stately seminal church-like organ. The group's career lasted for well on a decade. Sadly by the late 1980s the name of the group had it seemed been left in the annals of rock lore. In 1989 it seemed like that [sic] the ongoing story of the band was a definite closed book when the death of drummer BJ Wilson went largely unreported in the music press much to the chagrin of many die-hard fans. By the time of the band's final album and farewell tour in 1977 the group had been delegated to almost extinct 'dinosaur' status following the advent of the disco, New Wave and Punk musical revolutions. Over the following years the existence of the group would simply fade from the consciousness of the rock music world despite the fact that A Whiter Shade of Pale would continued to be lauded around the globe as one of those 'soulful' classic 60s numbers. With the Punk years themselves consigned to the dustbin by the early 1990s many of rock's leading classic rock lights returned to the fray in new guises. Deep Purple, Pink Floyd, Yes, ELP and others had recorded comeback albums and performed sell-out world tours. Procol Harum were no exception to the rule. In 1991 Brooker reformed the group alongside Trower, Fisher and Reid for the album The Prodigal Stranger. Respected rock drummer Mark Brzezicki filled in for the late BJ Wilson and the group embarked on a successful tour. Since then, Brooker has continued flying the flag with a rotating cast of musicians. An orchestral collection of Procol Harum covers entitled The Long Goodbye (The Symphonic Music Of Procol Harum) was released in the mid-1990s featuring The London Symphony Orchestra. 2100 people attended a live equivalent of the album at London's Barbican on February 6 1996. 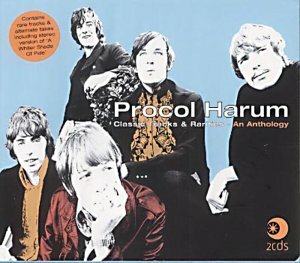 In June 1967 Procol Harum became only the sixth recording act in the history of British popular music to reach the UK Number 1 spot with this their very first release. Within weeks of forming Gary Brooker and Keith Reid's first recorded composition had become the fastest selling single in the history of Decca Records. Released on their own Deram label, A Whiter Shade Of Pale remained at Number 1 for six weeks before becoming a global hit of incredible magnitude, allegedly selling in excess of ten million copies. Needless to say the record has now achieved classic status. The song's influence was enormous. It is reputed to have inspired John Lennon's penning of I Am The Walrus while Elton John's lyricist Bernie Taupin even rates it as his favourite song of all time. Countless covers have been recorded, the best being by Percy Sledge, King Curtis, Joe Cocker and Annie Lennox. In 1968, it garnered the 'International Song Of The Year' at the 13th Annual Ivor Novello Awards. It was later named joint winner (along with Queen's Bohemian Rhapsody) of the 'Best British Pop Single 1952-1977', at the Britannia Awards to mark Queen Elizabeth II's Silver Jubilee. A Whiter Shade Of Pale sold upwards of eight million units worldwide, leaving an inexperienced and bemused Gary Brooker and Keith Reid the unenviable task of writing a follow-up smash hit. Homburg, reminiscent of the former in its tone of dark grandeur, was released in October 1967 and went on to sell a mere million copies. 1967 - Procol Harum Procol Harum recorded their self-titled début album at Olympic Studios in Barnes, London in the summer of 1967 at the peak of 'flower power'. They seemed to be in the right place just at the right time. However the group were tied into an all-embracing music publishing/management deal, which meant that instead of capitalising upon the success of A Whiter Shade Of Pale, it was decided to delay the release of the album for six months whilst a suitable label contract was negotiated. As a consequence, the album, which would have been ahead of the field in the summer of 1967, was almost ignored in the UK when finally released on EMI's Regal Zonophone label in January 1968. It did however manage to reach Number 47 in America during October 1967, based on A Whiter Shade Of Pale being among its tracks. That said, an engaging meld of psychedelic rock, blues and classical themes, the band's début was stately, sombre and ominous, the confusion and despair of the words set in ironic contrast to the deliberate architecture of the music and the religiosity of Matthew Fisher's organ and Gary Brooker's gospel-tinged vocals and piano. Building on the success of their début single hits, Procol Harum's second album, Shine On Brightly, was recorded over many sessions between the autumn of 1967 and the autumn of 1968. These two outtakes are the only surviving two tracks that emanate from a session recorded in October 1967. A much underrated album track in the same spirited vein as A Whiter Shade Of Pale, Conquistador would eventually provide Procol Harum with their third Top 30 single (on both sides of the Atlantic) when re-recorded with The Edmonton Symphony Orchestra in 1971. During 1968 Procol Harum producer Denny Cordell began to lose interest in the band. Despite being credited as the group's producer he was content to allow his assistant Tony Visconti (later to become David Bowie's regular producer) and Olympic Studios resident engineer Glyn Johns to hold the reins after the recording of the single Quite Rightly So and its B-Side in March 1968. Procol Harum's ambitious sophomore long-player appeared in October 1968 in the US some months before it was released in England. Expanding upon their symphonically influenced bombastic rock style the record was a big hit rising to Number 24 in the US charts. The group found themselves playing in front of 100,000 at the Miami Pop Festival on a bill that included Chuck Berry, Canned Heat, Fleetwood Mac and The Turtles. Though it failed to chart on home turf (despite excellent reviews), critics claim the album had the same impact on Los Angeles that The Beatles' Sergeant Pepper had on London. Released as a single in April 1968 the group's third single release failed to make the same commercial impact as its predecessors. Despite what would be a varying degree of singles chart success over the coming years, the public was now largely conceiving Procol Harum as a respectable albums based act. Originally entitled 'Magnum Harum', this is classic Procol Harum, with Robin Trower's guitar in ecstatic form. Interestingly, for the record, The Who's Pete Townshend, who is often credited with citing The Pretty Things' S.F. Sorrow as the major influence on his rock opera Tommy, is said to have claimed that In Held 'Twas In I was just as much a major inspiration. As Procol Harum had become a major headline band in the USA in the late 1960s the group decided to start recording their third album at A&M Studios in Los Angeles (Long Gone Geek and Wreck Of The Hesperus are the only two tracks to survive from these sessions). However they soon upped their bags when they were offered the chance to complete the album using EMI's eight track facilities at Abbey Road Studios in London, in January / February 1969, with keyboardist Matthew Fisher working as the band's producer. With a classic cover (painted by Keith Reid's then girlfriend Dickinson) featuring a dry spoof on the old John Players Navy cut cigarette packet design, Procol Harum's third opus admirably encapsulated the spirit of the band. A Salty Dog was much lauded around the globe when it was released in June 1969 and is considered alongside Shine On Brightly to be the original group's best work, combining a synthesis of high-energy blues and grand classical inspired influences. It returned the band to the US charts at Number 32 and subsequently reached Number 27 in the UK, the group's first long-player to chart in their own country. "Procol's Citizen Kane", according to Matthew Fisher this the title track of the band's third album has since been covered by artists diverse as Sarah Brightman, Billy Joel and Marc Armond [sic]. Soaked in Keith Reid's dark, eerie, regret-filled lyrics it was to become one of the band's most popular songs. The tasteful production features sweeping orchestrations, subtle sound effects and a dynamic arrangement. By the time A Salty Dog was released, both keyboardist Matthew Fisher and bassist Dave Knights had split from the group. However it was decided that Fisher would at least remain in some sort of production capacity. Former Paramount Chris Copping was enlisted to play bass and lyric writer Keith Reid (a non musician) attempted to play the Hammond organ. Procol Harum were now a four piece (in effect The Paramounts re-born). This led to a much more rock orientated, darker sound. Four tracks for the group's fourth album Home were recorded on this basis, but scrapped when they proved to be 'unsatisfactory'. George Martin protégé Chris Thomas (the man who produced The Beatles' song Helter Skelter) was enlisted as the group's producer (a relationship that would endure for a further four albums) and the record went into production throughout February/March 1970. Home was released in June 1970. Featuring another eclectic Dickinson cover. It charted at UK Number 49 and US Number 34. No singles were released from Home in the UK. However this Robin Trower/Keith Reid composition, a take on Elvis Presley's Mystery Train, was released as a single in the United States. For Procol Harum it heralded a new and leaner urgency with the organ's prominence in the mix diminished. An epic musical masterpiece that is quintessential Procol Harum at their progressive best. Here Keith Reid's lyrics are preoccupied with death and nightmares. An evocative composition, this surreal sea shanty [!] is a mix of 19th century keyboard oratorio [!] with fiery blues riffs blazing at its core. An up-tempo number featuring some great (albeit uncredited) harmonica playing from the legendary Larry Adler. Procol Harum recorded the tracks for their début album in mono. However when it was released critics panned its production qualities against the stereo excellence of The Beatles' Sergeant Pepper. This early 1967 take of the band's very first hit is taken from an original four-track master tape. In 1997 it was mixed-down and re-mastered in glorious stereo by Tom Moulton some thirty years after it was recorded. A big fan of Classic Rock, Mark Crampton served his stint with a variety of music titles before founding his own rock magazine Riff Raff in 1989. Besides his work in publishing he's also acted as a top compilation consultant for a variety of music labels and is currently furthering the rock music cause in new media circles.